Join the discussion on our forums! Come discuss Magic Carpet over in our dedicated Magic Carpet discussion topic. After you play a 1-Cost minion, give it +1 Attack and Rush. Its small yet fierce riders are affectionately known as rug rats. "A whole new Zoooo! (lock)"
Will see as much play as Witch's Cauldron (a little bit). How does the carpet attack by itself? Does it just ram itself into the opponent so fast that it hurts? Does it wrap itself around its opponent and squeeze them? Then you also think about how a Silver Hand Recruit, a trained paladin with a hammer, is as strong as... a carpet. Then it also has 6 Health, meaning N'Zoth, the Corruptor, a giant tentacle god, can't kill it by itself. That sounds like a damn sturdy carpet. No good. 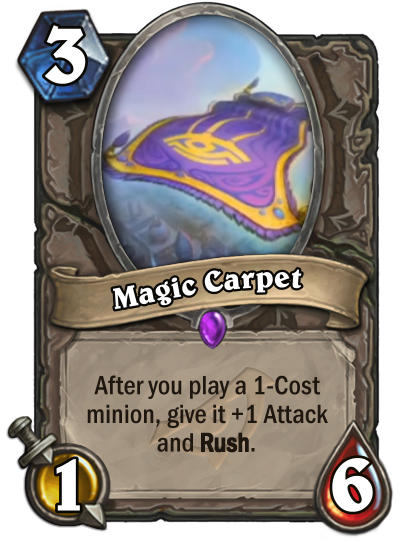 Only played minions trigger the Carpet; summoned ones don't work.